I started out appending this to an old English Shepherd vs Aus Shepherd vs Border collie thread, but decided it really was worth a thread of its own. So, got a nice cup of yer fav beverage? Good, 'cuz this is gonna be a long post! This is about Amy and Andy, who got adopted, for the 2nd time, last August, at age 2 years, 8 mos. They started both adoption journeys at the same agency in Kentucky. 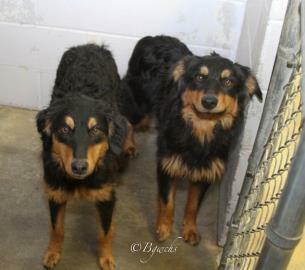 That agency listed them as "English Shepherd mix". No matter, some kind of collie mix! They have about the most complex personalities I've ever dealt with in a dog. And training has been a double challenge. Because of them I now know what a shepherd's whistle is, and I know how to use one! Which is an accomplishment in itself, I garontee! (In case you don't already know this!) I have learned more nuances of training theory than I ever realized could even exist. And, I thought I already knew something more than average on training! I've got questions out the yazoo about how to deal with them - but I've also got plenty of answers. So I'm not really asking questions, but I would love to hear helpful thoughts and suggestions! I adopted them a week or two after that photo, at an adoption agency in Massachusetts, where they had been transferred. In the agency's meeting area, they were friendly, more active by a little than is typical for rescue dogs at such times, and obviously attached to each other. Where one went, the other went. And, haha, poor poor naive me, I did not foresee what that entailed for training! Of our last two dogs, one was a hound mix with such a strong hound personality that we were lucky to get a recall trained at all, and the other was my buddy, but not the smartest of students. Willing, loving, caring, and well-behaved, but he just had his limits. We'd lost them both within weeks of each other. And I wanted a couple dogs who might be a little more able to do things! Well, you might say we got that. Andy can, and will, jump from a standing start onto a 36" tall counter with 18" of space to land in. Eat the cat food there, and jump back down. Amy easily clears a 36" gate - and can leap a 48" fence. Which might have something to do with why they were locked in a shed by their first adoptive family. At the rescue center they managed to open slide-lock crates from the inside! Within the first few weeks, I felt I had some recognition of every training phrase our old dogs had, and more. But they did not feel compelled to respond to the commands if they found something ELSE interesting. Typical adult dog training. When dogs are puppies, you can get solid responses, and then refine the response for new situations. With adults, it ain't the same. It's kinda like arguing with a teenager: you've got to cover everything, somehow, before you get any respect. And these guys were, well, different. Sometimes I would get non-compliance because the dog felt that "they could". Sometimes it was something more interesting. Sometimes they showed that they had never gotten the "compliance" message in whatever early training they had! You know, when a dog is doing one thing, and you say do another, and the dog acts guilty and keeps doing whatever they were wanting to do? They KNOW what the desired behavior is. They know they will get a reward for doing it right. They MIGHT know they will get punished for doing it wrong. And they keep doing it. Well, hindsight is 20/20, eh? So, obviously, the dog finds whatever they found to be MORE interesting than you, your treats, or your punishment. So, here is the first lesson these guys coerced me into learning: use what the dog loves doing as a reward for doing the "work" you want the dog to do. Like going for a walk! Or playing together! (I'll tell you something about how these two look at play in a minute.) The dog likes going for a walk - so use it as a reward! Anyway, life proceeds. I train. They listen. Or not. They have, as I said, complex personalities. They are brave and protective in their element: outdoors, woods and fields, and at "home". Obviously, the concept of "home" is somewhat fluid, given the circumstances. They are devoted, and are more "one-person" dogs than any we have ever owned. They have followed me everywhere possible since about the 2nd week living here. If I am in the yard, and they are inside, they move constantly and nervously, they whine, and complain, to whomever is inside the house. If I take one dog out and crate the other - Andy will bark constantly while they are apart. Amy does not bark so much, but she is a nervous mess. The crate, for them, in such circumstances, is not a safe place. It is a prison. They know this. And their biggest concern is missing the other, and me. Well, the obvious answer is positive association training for the negative things, and positive reward training for the necessary basic behaviors, right? Yeah, right. The negative things are complex enough that a simple positive association is, well, difficult. And I'll tell you why I know something about such situations. Our last adoptee, "Klinger", would get car-sick every time he rode in a vehicle. Pretty clearly associated with the long truck ride north from Tennessee when he was a pup. It got so bad he would vomit on entering a car. It took me 3 years of positive association to get him to settle down for a car ride. And another 2 years before he could enjoy a car ride. I've got a little experience countering negative associations. But, listen. I'm sorry, but it is late, and I can not continue. Next episodes? How the working dog personalities manifest? Like making toys out of apples (they did this - they won't let me do it with them!)? How about that NILF? It's part of what is working here. Deserves a talk! And there is more. How their prey-drive / herding instinct has manifested, and how I have not yet been able to use that. How their desire for order has manifested, and created issues. So, enough for today. I leave you with this photo, of the two, today. Oh, I hate FB, but I do use it. I love the concept, but FB has no regard for privacy or online security, and that is OT, so I'll shut up! There is an ES breeder in central Mass who holds semi-annual meetups. They are on FB, and I've tried a couple of times to get a message through and get a response - no luck. I got in touch with an ES rescue person through a rescue agency person I respect, but outside of exchanging some emails, I didn't manage to get much out of that. One of my problems is figuring out what reactions from the pair is breed insinct, and what part is experiential learning. I think I said that they are complex personalities - and they are. And they don't learn like most dogs. It's different - but I'm having a bit of trouble defining exactly HOW it is different. One thing I think is that they want to do what is needed by me - but without commands. This might sound odd, but I see them trying to anticipate actions. And that sort of independence is exactly what you read about when you read about English Shepherds and traditional farm collies. We are making progress, although they are still quite affected by their first years. I'll write a bit more later. I will go to FB and do a lookup, but if I don't find the groups you are thinking of, could you tell me enough about those FB groups that I will surely find them? Foxhill Farms does the annual meet ups, normally the end of Sept. I haven't been able to make any of them in the past few years (I'm in NY), because they always fall during a busy time at work. There are quite a few ES people in the NY, MA, CT area. The FB group is really a good place to chat with ES people, but there are also a few yahoo groups. Lots of people in both places that have had ES's longer than I have been alive. Foxhill ES! Yes, they are who I tried to open contact with. I left, if I recall, one message on FB, and two emails. I got no response, and after that many attempts with nothing back, it would fall into my rule book as "rude" to try again. If you think I should try again, please say! I am getting results training these guys, even if a bit slowly, so my urgency has gone down. I have doubts about whether they would enjoy a group meetup like they have there. We are working on multidog/ multipeople situations, but it is not a top priority. So maybe once a week we do something to expand our horizons on that front. We went down to our local trail set yesterday, where it is our local unofficial off-leash dog park. I was quite pleased with how they did. Sometimes they get panicky with too many people or too many dogs. We managed to get them in a down-stay (off-leash) and hold it while another dog person, whose dog was NOT friendly, passed by. The friendly dogs we managed to hold down-stay, but not quite so well! This pair does not have a lot of self-control, as in self-calming. When they get excited, it is difficult for them. We are working on that in just about everything we do! Oh - and thank you for the group names! They could be very useful! I looked them up, and see dogs that look so much like Amy and Andy - just amazing! One thing I think is that they want to do what is needed by me - but without commands. This might sound odd, but I see them trying to anticipate actions. This is an interesting comment. I've been researching ES myself, as we're considering one after losing some poultry, and found a similar description from a rancher out west. He essentially said ES seem to reach their maximum potential by spending a great deal of time out doing chores with the farmer, so they can learn about the tasks and decide for themselves how to be most helpful. If this is true (and your experience seems to be bearing it out), then teaching a broad understanding of the world/situations (or the "why" of things) would be more important than conditioning a response to a directive. It's a totally different approach to training than I'm used to. Well, a working herding dog has to do a lot of thinking on his own, just to respond to the critters they are working with. Yep, it is different! I've gotten some really great comments and thoughts by going to a Yahoo group for working English Shepherds. One of the thoughts is that a lot of what I'm seeing is likely due to the deprivation of their first years. By which I mean the social and mental deprivation. And, they grew up as siblings, and every ES breeder who had a comment says they should be separated and trained separately once they've been weaned and are "out of the house". As siblings they bond to each other and look to each other for decision-making, when they should be looking to their human. . . .He essentially said ES seem to reach their maximum potential by spending a great deal of time out doing chores with the farmer, so they can learn about the tasks and decide for themselves how to be most helpful. . . .learn about the tasks and decide for themselves . . .
. Seems to me to be stronger in them than the other shepherd types. But they all have it. In the working collie types, add "please the human" as a high priority in the skillset. Whereas a scent hound has that last imperative as a footnote at best, but definitely knows how to decide for themselves! I have communicated with several breeders / trainers of herding collie types. They all agree that raising siblings together is highly difficult. One said it this way, and I like his wording (1): "They wind each other up. They are jealous, and the keep each other immature". (1) That is paraphrased very slightly. I didn't ask for the trainers permission to use this here. This is appropriate use, but might not be polite. As a consequence, I have not credited his name. Time did not permit me to finish my last post! Life intrudes! Their training has proceeded well, I think. EVERY experienced trainer/breeder I contacted said, in some variation: "better to separate them". The way it was said that I like best was "they wind each other up. they will be jealous, and they will keep each other immature". To which I can say, positively, "yup!" The jealousy manifests in a mutually competitive drive for attention and benefits. It is not notably hostile, but it has its moments. This is the same trait that I think kept them "sane", in doggy terms, when their early life kept them isolated from the rest of the world, locked in a shed. I will guess it probably got them in trouble and locked in the shed in the first place, when their first family could not, or did not, provide enough activity for them. Since out-and-out separation is not a desirable outcome here, I have done my best to interrupt the self-reinforcing feedback loop they developed. So far, with some success. By focusing on individuality, "Amy stay. Andy come", and then limiting their mutual and joyful play response to excitement: "no play. Stop. Not now", I've been making them focus on communicating with the human, rather than each other. Another is NILIF (which you may see as NILF, or NIFIL, Nothing In Life Is Free). Everything we do now is preceeded by an exercise in working together. To eat, they have to "down" (and stay), and then proceed thru a few other commands to show me they are learning how to "self-calm", and that they can focus in the face of distraction. When we walk, they have to perform individual tasks periodically during the walk (Up-on, walk-on, over, down, stay, stop, etc). Mostly they are not permitted to walk off-leash together. One is on while the other is off. It is working. It think it would work better if they were trained alone, and maybe we can incorporate that more in time. But, for now, it is working well enough for their life with us, which is ultimately is the bottom line, eh? New poster here. 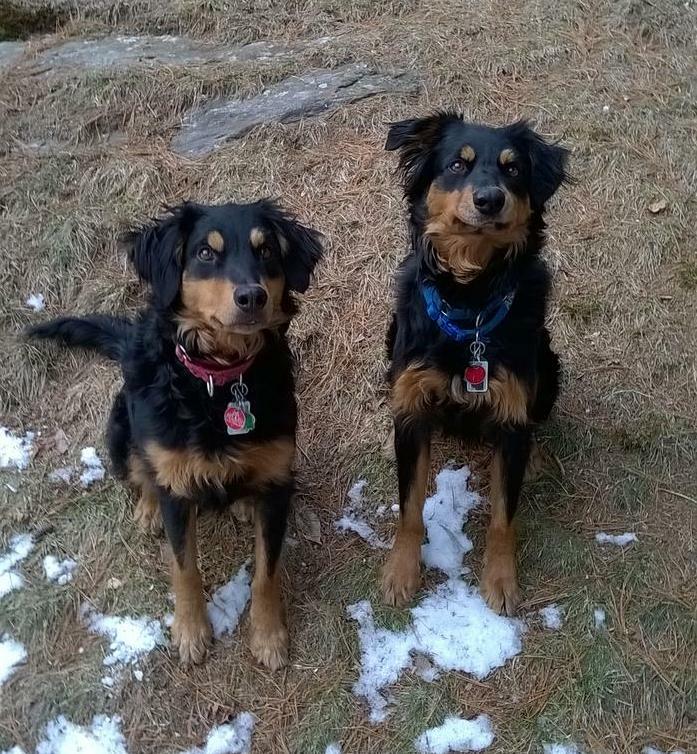 My wife and I adopted an English shepherd type from National English Shepherd Rescue about a year ago. 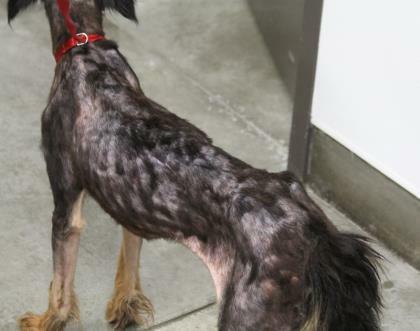 He's 4 years old and had been on a farm (where he might have been treated roughly) before going into rescue. He's got some reactive issues and can get nippy if someone strange grabs him around the scruff (nipped my wife once early on, which didn't endear him). Before we got Alfie he spent some time in a foster environment on a small farm with poultry and livestock. We turn him loose with our small flock of chickens and he ignores them. He has a totally different attitude toward rodents, which he chases down, kills and eats if given the opportunity (we live in the country). I've had Alfie enrolled in obedience classes at my dog-training club since shortly after we adopted him. He was pretty overwhelmed upon his first exposure to a bunch of new people and dogs, but he's come a long way in the ensuing months. Hiero, give yourself some time. The dogs will come around.